Growing up on the wrong side of the tracks, young Stella Martin (Stanwyck) manages to catch the eye of Stephen Dallas (John Boles), a well-bred business executive. The two fall in love and marry. For a time they’re happy, but after the birth of their daughter, Laurel (Anne Shirley), the marriage begins to deteriorate. Stella wants to go out dancing and rub elbows with the upper-class folks at the country club. Stephen expects his wife to be content to stay at home with their child, a much quieter existence than the life Stella desires. They eventually divorce, with Stella having the main custody of Laurel. Stella is determined to give her daughter the things she never had, but when Stephen begins a new relationship, Stella feels her closeness with Laurel slipping away. Always putting her daughter’s happiness above her own, Stella faces a choice no mother should have to make. Stanwyck received the first of her four Best Actress Oscar nominations for her role as Stella. Stanwyck was so determined to get the part that she submitted to a screen test—something unheard of for a star of her caliber. She convinced the director (King Vidor) and the producer (Samuel Goldwyn) that she could be convincing as a mother, especially as the character ages into midlife. 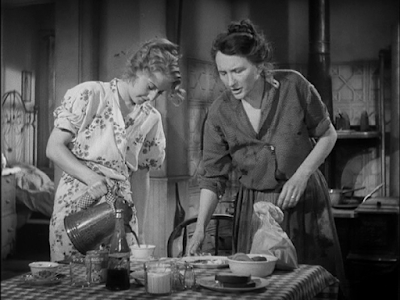 The supporting cast includes Marjorie Main, Barbara O’Neil, and a very young Tim Holt. Check out the introduction to Stella Dallas by Robert Osborne and Drew Barrymore. Looking for more "Stanwyck on State Street?" 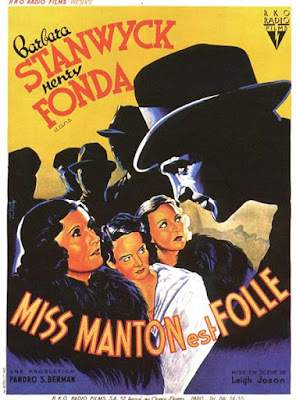 Look for The Mad Miss Manton to screen on April 1. This screwball comedy paired Stanwyck and Henry Fonda for the first time. They made a total of three movies together: The Mad Miss Manton (1938), The Lady Eve, and You Were Meant for Me (both 1942).